In a world “moving too fast” in terms of technological development and the society’s reaction to new innovations, universities and higher education institutions are “called” to react faster to change, as if change is always necessary. Questions, concerns, complaints, frustrations, anger, and even hatred are being thrown around the departments in universities where the legislation is pushing for reform. The fear for changing education models to the emerging MOOC-like structure is constant regardless of the disciplines. Just about two weeks before finals week here at St. Cloud State, the university’s online education and distant learning taskforce requested to conduct a roundtable discussion with a student organization I was chairing at that time with hopes to gather students’ comments and concerns with the existing online learning structure (at SCSU). Among some questions that have been regularly brought up is the worry that online education may not deliver the kind of rigor a traditional brick-and-mortar classroom could offer. Students and faculty alike are somehow both for and against MOOC-like delivery method — they like the idea of open-access education, but are concerned about the quality of the learning experience. Haven’t heard it? Let’s say it once more. But according to the Berkeley PhD candidate this struggle is not new. The MOOC model has been around since 2008, when Stephen Downes and Georgia Siemens delivered their first massive open course from University of Manitoba to thousands of students worldwide. By the Internet’s terms, four years is a long time. 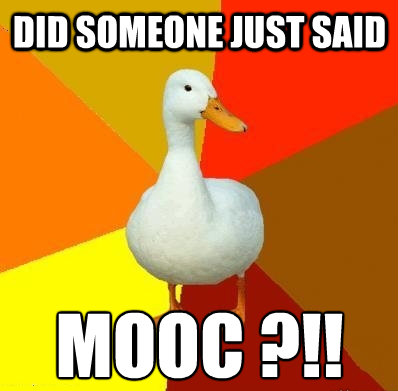 Perhaps Bady was right, the MOOC moment was already too late. Despite the hype on MOOCs today, online education is already changing the way higher education does its business. Knock, knock, has anyone forgetten about the pioneer of online degrees, the University of Phoenix? What we are worrying now seems to be yesterday’s problem. While we are worrying about the future, the future is now! As academics and education leaders, we need to come together to figure out ways to cope with the change rather than arguing over the necessity of the change. The solutions may become clear as soon as we see MOOCs as opportunities instead of problems. Like it or not, huge fundings have gone into developing and improving MOOCs and students from all over the world are quickly becoming citizens of the MOOC mansion. This, however, doesn’t mean that we are giving in to new technology. No, we are not forced to change. We adapt to what our students need because this is simply the mission of higher education. No matter how universities and colleges look like in 10-20 years, if they are still around, the purpose of higher learning should remain interested in putting students first. How things look like in the near future can be very different. But as long as we keep our eyes on the wheel, we will arrive at the same destination as intended.